ELLICOTT CITY, Md. -- Roaring flash floods struck a Maryland community Sunday that had been wracked by similar devastation two years ago. 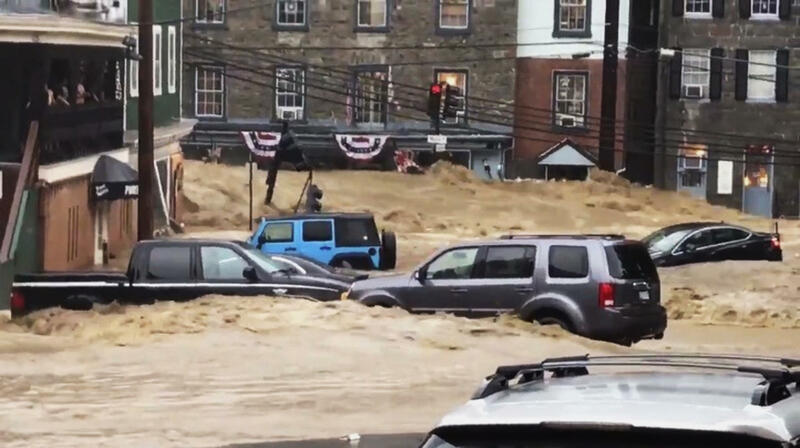 Ellicott City's Main Street turned into a raging river that reached the first floor of some buildings and swept away parked cars, authorities and witnesses said. There were no immediate reports of any injuries. CBS Baltimore showed images of turbulent water rushing down Main Street -- the same area devastated by flash flooding in July 2016. That flood killed two people and destroyed local businesses. Maryland Gov. Larry Hogan declared a state of emergency for the stricken area Sunday and traveled there for a firsthand look at the destruction. "The immediate focus is ensuring everyone is safe and secure," Hogan said in a statement. "I strongly urge all Marylanders to monitor the weather, heed all warnings, and avoid the affected areas." Fire rescue crews were going door-to-door to make sure residents were not trapped in lower-level buildings, CBS Baltimore reports. Jessica Ur, a server at Pure Wine Cafe, told the paper she watched as gushing waters swept three or four parked cars down the street. She had been around the last time the area flooded, but said this time it appeared worse. "If you are trapped, we are coming," the Howard County Department of Fire and Rescue Services tweeted at one point. It added that multiple rescues were carried out, and rescue swimmers were called in to help. The department also said swift water units from as far away as Northern Virginia were summoned. The disaster came on a day when the National Weather Service said a flash flood warning had been issued for what it described as an "extremely dangerous situation." A meteorologist said about 8 inches fell in Ellicott city in a six-hour period.